Sick of snow and ice? Play wave tag at One Mile Beach. Silver sealines are yours alone. Only the surf is white. Entrap tide and rustle sand. For the Wavepool project, I engaged in recording sorties from the studio in January 2008. The task was to find that very pace and texture, a surf softly breaking, almost like breathing, that I had heard in early January during a kind of daydream when my muse graced me with a visionary sound for a time one day. 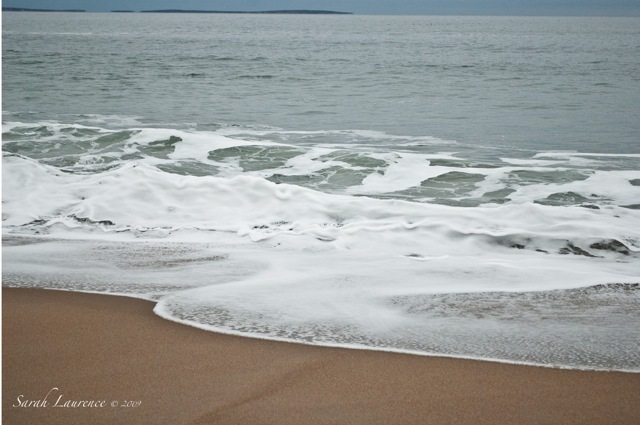 After four months of sometimes repeated visits to multiple beaches from Bar Harbor to Plum Island, it was in May 2008 that I returned once again to Reid State Park. Several times I had visited Reid that Spring, as if I had somehow sensed its potential. Yet each time, I had come away without a useful recording. As I walked onto One Mile Beach with my pack and gear, a happy couple nodded and smiled as they returned to their car and drove away, leaving me alone. There were no cars, no people, no happy dogs, no lovers, no gulls or terns, no boats or planes, no blustery winds. 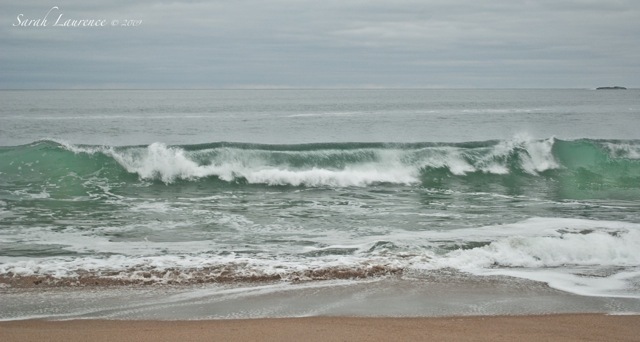 It was, for once, an absolute soundscape of slow surf. Precisely halfway down One Mile Beach, the surf sang to me, and I recorded. Then time passed back in the studio immersed in composition as I recreated and mixed the simple, deep ensemble my muse had delivered four months earlier. You can listen to a clip of Wavepool in the upper left corner of Robert Rand's website. Note: I did not receive any free products or compensation. Blog Watch: Cynthia@catching days went beach walking too. Lakeviewer@sixtyfivewhatnow lives on the beach as does Delwyn@a hazy moon. Just looking at your great shots brings back all the scents and sounds. It must be such a comfort to the soul to live close to the sea. Thanks for the links. I will never forget this park. I almost drowned there when I was a teen. Stupid mistake I made by trying to swim against the waves to get my footing on sand instead of floating in to shore. I was never so grateful to see a lifeguard in my young life. To this day I'm a bit leery of swimming but do so anyhow. Lovely waves and a wave recording would be so soothing. Gorgeous photos. I think we were at this park a few summers ago, I'll have to look through my albums. 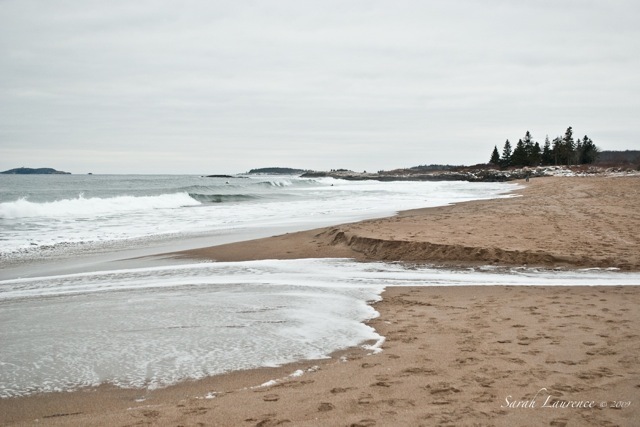 I loved going to Parsons Beach in Kennebunk in the winter. The dunes, grasses and the water all took on such different shapes under the ice and snow. Green waves crashing and "softly breaking, almost like breathing" is, without a doubt, my place to be. I will click over to Mr. Rand's site. The sea is the most enigmatic of elements. I'm glad to be a water sign because that explains my affinity to all things liquid. Your photos are testament to both the tranquility and turbulence of this natural beauty. Many thanks. I enjoyed reading about Robert's project a lot. Beautiful, and it looks cold!! Don't you just love the sound of the waves. Lovely pictures, Sarah. 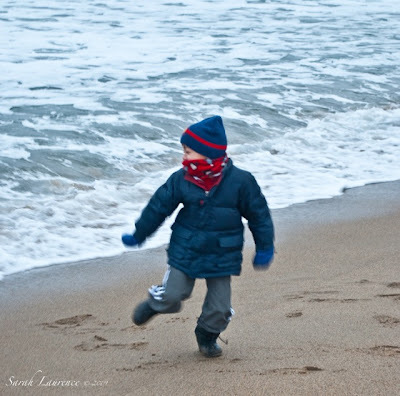 And yes, one can play at the beach even in winter. Bonnie, yes, I am lucky to live near the sea. Thanks for adding the scents to the images, words and sounds. Tina, how scary! What a relief that the lifeguard saved you! I’m a bit wary of swimming in big waves, especially at Reid. I enjoy swimming in calm seas and love walking on a beach best of all. Cid, wouldn’t it have been funny if we’d been at Reid at the same time? In the summer, I usually go to Popham Beach instead which is a little closer and less buggy. It has a 3-mile beach. Reid is better with little kids since it has a warm lagoon and a snack bar. We used to go with our playgroup. In the winter I walk at Reid when the tide is too high at Popham. David, I’d love to hear your reaction to Rob’s music. I tried but failed to embed a sound clip on my blog. It’s not up on YouTube. ACIL, I’m a water sign too. It fits. Blogging about music made me think of you. Pamela, it is cold, especially with the wind blowing, but I do hunger for the sound of the sea. Lakeviewer, I love the ocean shots on you blog. Oh, I love it! 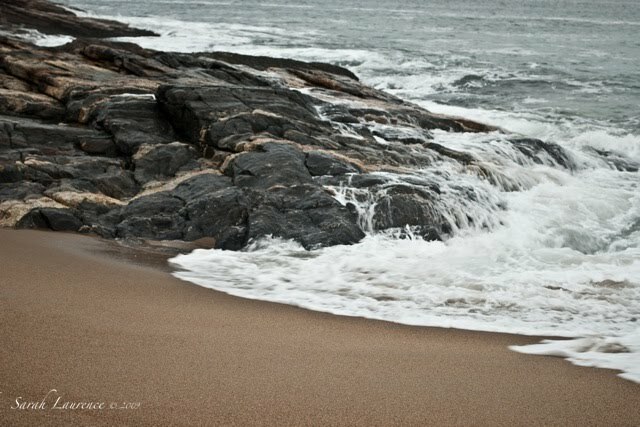 Hopefully, soon we will live on the New England coast and I will be able to enjoy it in winter like you! I love a deserted beach... Can you walk to the beach for a daily constitutional? Alyson, I hope things work out with your relocation. Delwyn, my house is 2 miles from the sea. I bike to the water during the warmer half of the year. The beaches are a half hour drive away so I can’t go daily. Those green waves are clear as gemstones, so beautiful. I clicked over to hear the waves and was entranced. It is indeed like breathing. Thank you for a moment of clarity. Very interesting. It must be as pleasing to hear as would recordings of birds outside the window. The rhythmic beat of waves and the sight of a silent beach are deeply soothing. This reminds me of Indian musicians I've happened to see play an ancient musical instrument called the Jal Tarang. Jal is Hindi for water. The musicians use containers of different specifications, and sometimes alloys even, before filling it up with water, to different levels, and then play the components to create waves in the stored water that modify the sounds to melodious musical notes. The bowls of water used in Jal Tarang by a single musician can exceed 15, requiring much skill, with the musician often stirring the water quickly in specific bowls during his performance. However I do not see Jal Tarang as widely practiced in India as say the Tabla or the Sitar among others. One reason could be that the Tabla and the Sitar among others serve as accompaniments during Vocal recitals, something the Jal Tarang is not much used in, except maybe in some attempted fusion music. It's mostly seen in live solo performances on stage. Your images may compel me to take a drive to the beach. I enjoy it as much in the winter as I do in the summer. Even without a soundtrack just looking at these waves makes me feel more relaxed, Sarah. I used to have a tape of sea sounds I played at night to help me fall asleep or to relax during stressful times. There's nothing like the sound of the sea to soothe you! Tricia, Rob’s waves are musical gems. Cynthia, the ocean is a wonderful way to connect. Anil, what an interesting way to make music. I’d love to see images of Jal Tarang musicians on your blog. Les, you need a break from snow even more than I do this year. Rose, I play waves on my white noise machine. Rob’s music is more mellifluous. The ocean is so soothing. I've looked at Delwyn's pictures . . . and how come yours don't feature any brown bodies lolling in the water? Never mind; gorgeous pictures of a winter beach. We are just about to fly to Buffalo, not so far from you, to go skiing. I'm trying to psych myself up for the cold! Such lyrical pictures, but capturing the iciness and the bitter chill. We are much too cold here still too. Bee, I offered to swap beaches with Delwyn if she were too hot. Have a wonderful vacation. I hope Buffalo has more snow than Maine. It’s actually not too cold today – meant to reach 40! Ewix, you look colder in NYC – such amazing snow! This was SHEER DELIGHT, SArah! A walk on the beach would be nice. I would love to hear the sounds of the ocean and smell the salt in the air. I wonder what your ocean smells like in February. Having grown up in the Bay Area, I am used to the smell of the Pacific. I found myself shocked a few years ago when I discovered that the Atlantic had its own beachy scent. Tell me, does the winter beach smell different than the summer one? It sure looks as beautiful. I love having the beach to myself! The beach and the English countryside are my favourite places for a nice long walk. I like the green waves; so pretty! Jan, I enjoyed the new RSC theater update on your blog too. Tracy, yes, a visit to the sea engages all the senses. You are right. DM, I can barely smell the winter sea because I’m so wrapped up in my neck warmer and hood. Still, the air is fresh as it bites my nose. The scents are more intense in the summer. JAPRA, how true: the best part of winter is having the beach to myself. Donna, the color was really intense and a welcome change from the grays and whites of winter. The photographs and accompanying text are beautiful. I love seeing photos of open water and beach. The eye tires of snow and ice. I will check out the wave recordings. Hope all's well and that you are getting lots of writing done. Kate, I think you’d love Rob’s music. It’s so nice to have you back to blogging. I’ve missed you. All is very well with me. I wrote a half chapter today.